Clematis vitalba L. is the UK's only native Clematis. Commonly known as 'Old Man's Beard', it can be seen scrambling through hedgerows and trees along the roadside, and is especially obvious in the winter months. 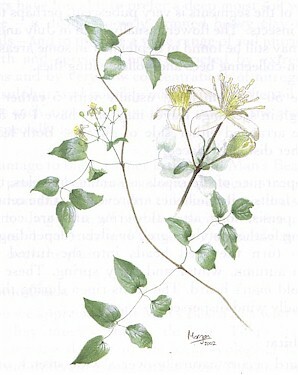 Its Latin name refers to its flower colour and climbing habit (alba = white; clematis = climbing; vitalba = white vine). One or two other Clematis species sometimes escape from gardens and become established in the wild. Of these only Clematis flammula bears any resemblance but its flowers are somewhat larger than those of C. vitalba and pure white, and its leaves are a different shape (bi-pinnate). See illustration. Perhaps the oldest recorded common name, in England at least, is Traveller's Joy. In the sixteenth century John Gerrard described it in the late autumn hedgerows of the southern chalk country as - `decking and adorning waies and hedges where people trauell'. At that time Gerrard described it as having 'no vse in Phisicke', but, in fact, there are a number of traditional uses found throughout Europe. Those related to the `Phisicke' seem to be rather dubious and readers should be warned that all parts of the plant are poisonous if taken internally and irritating if used externally! Nevertheless, in antiquity extracts from leaves macerated in oil were famous against 'the scale’, and in the 18th century beggars rubbed their bodies with its juice to create ulcers 'in order to excite the commiseration'. The toxic principle is actually dissipated by heat or by drying, and after this treatment the plant has been consumed, but perhaps only by the desperate. Some reports say that young shoots can be cooked and used like hop (Humulus lupulus) shoots. Much more commonly the dry winter stems were used as a substitute for tobacco and smoked by poorer country folk, hence some of the local names from the south-east of England - Boy's Bacca and Shepherd's Delight. More prosaically, the stems are used in basketry. Old Man's Beard is a perennial Clematis, woody and deciduous. When it loses its leaves in the winter it reveals a tangled mass of climbing shoots that have scrambled over its host, together with masses of silvery seed heads. Hence, Old Man's Beard. Like most other Clematis species it climbs by means of the leaf stalk twining around any convenient support. The stems are quite distinctive. Young stems are tinged with purple and have six longitudinal ribs; mature stems are stringy with pale brown bark with longitudinal furrows. The older the vine the more woody and stringy it gets. The plant is very vigorous. It can climb to canopy height with sterns reaching 30 m in length and 4 cm in diameter. The flowers are fragrant when fresh, approximately 2 cm diameter and borne in 50 mm to 120 mm terminal and axillary panicles. They are produced on the current season's growth. The fragrance is said by some to be similar to hawthorn and by others to be almond scented. Some argue that it is not at all fragrant but perhaps this is because they have not encountered fresh enough flowers. There are 4 perianth segments (sepals) that are greenish white. Close-up in bud they look like miniature white pom-poms because the outside surface of the segments is very pubescent, perhaps to protect against hungry insects. The flowers usually open in July and August, although they may still be found in September in some areas, and are visited by pollen-collecting bees and pollen-eating flies. The leaves are .50-150 mm long, usually with 5 rather variable leaflets, although in seedlings leaves may only have 1 or 3 leaflets. The leaves are arranged either side of an axis. Both leaves and leaflets are rather distantly placed. With the disappearance of the sepals as summer retreats, the many one-seeded dry fruits called achenes are revealed at the centre of the flower. These persist long after flowering and are conspicuous because the long feathery styles - grey or silver (depending on your perspective) - turn the seed heads into the tufted balls so conspicuous in autumn, winter and early spring. These feathery styles are the old man's beard. The seeds ripen during this period and are eventually wind dispersed. Old Man's Beard occurs naturally over a wide stretch of Europe from the UK in the west to the Caucasus, Afghanistan and Lebanon in the east, and from the Netherlands in the north to the Mediterranean in the south. It also crosses the Mediterranean into North African. Within this range it can it can be found anywhere from sea level to 1800m. Where it is found elsewhere, it is by virtue of its spread by Man, usually with good intentions as a garden plant. These days the inhabitants of Ireland, New Zealand and the NE & NW United States are not always so enamoured of it. In nature it tends to be very common on calcareous soils, in a wide range of habitats, for example scrub, wasteland, forest remnants and margins, hedgerows, canopy light gaps, roadsides, gardens, sand dunes and on quarry waste. On dunes, or in other habitats where there are no shrubs or trees to climb up, it grows flat against the ground. It is found most commonly in wood margins and hedgerows. Gardeners have found it to prefer a deep moist soil with its roots in the shade - it dislikes poorly drained heavy clay soils and light sandy soils - and to tolerate a wide range of soil nutrient conditions. Its growth and spread is only restricted by extremely acid soil conditions and by very low concentrations of nitrogen, phosphate, calcium, sulphur, and possibly magnesium in the soil. On the other hand, it is such a greedy plant that it inhibits the growth of nearby plants, especially legumes. One advantage to the gardener is that Old Man's Beard is relatively pest free, perhaps because its toxicity protects it from other animals as well as humans. Rabbits don't like it and only 9 insects have been recorded feeding off it, all of them specific to it (i.e. monophagus) - 6 on leaves, 1 on buds and flowers; I on seeds and 1, an aphid, generally over the plant. In Europe we appreciate Old Man's Beard as a wild flower; in New Zealand they most certainly do not. There its introduction demonstrates the danger to the local ecological balance of new species from different biota, rather like Rhododendron pontica in the UK. Outside its native range its ecological behaviour changes and it becomes extremely invasive especially in areas where high rainfall is combined with high summer temperatures - conditions it does not encounter in its home range. It is rated as a noxious or pest plant in New Zealand, because once it gets a foothold it strangles native trees in the bush and when they collapse it continues to grow in deep blankets that prevent germination of replacement seedlings. Now, in New Zealand, C. vitalba is prohibited from propagation, sale and distribution. Following the New Zealand experience, Old Man's Beard has been proposed for listing as a pest in the north-west USA. Old Man's Beard was brought to New Zealand as a garden plant, and was first recorded as growing wild in the mid 1930s. Now sporadic infestations occur in the Bay of Plenty region, especially near Lake Tarawera which is a national park with one of the few large areas of native bush left in the North Island. Most at risk is secondary growth or disturbed native forest where wind blown seeds can best find suitable conditions for germination and early growth. Here Old Man's Beard climbs high into the canopy and smothers the host tree, blocking the sunlight and eventually killing it. To try to rid themselves of the plant, the Kiwis have undertaken much research and discovered that quite extreme measures are required. The vines must first be cut at waist height and at ground level. These two cuts are necessary - if the cut is only made at waist height the plant will shoot from below and if cut only at ground level the aerial stem will re-root! Then all cut-away stem segments are burnt or buried to prevent re-growth, and the aerial vine is left in the tree to dry out so as to prevent damage to the host. Finally, both stumps must be painted with a specially formulated herbicide mix. Of course all seedlings must also be dug out. Perseverance is required because this treatment must be repeated every year until re-growth is checked and the seed bank is emptied. Experiments are also underway with biological control measures - introducing one of the insects (Manophadnus spinolae) known to feed on its leaves. All in all, as a garden plant C. vitalba does not have a lot going for it - small flowers, little fragrance, vigorous scrambling growth - it can be outdone in nearly every respect by one or other of the modern garden varieties. However, as a wild plant in its native territory, Clematis vitalba, does indeed bring joy to travellers and, for me, in this situation in the winter time it betters all of its cultivated relatives. It evokes winters long gone, ale houses and log fires - what could be better. Flora of the British Isles. Clapham, Tutin and Warburg (1962). Wayside and Woodland Blossoms. Step (1905).